Your child can discover their creativity with the Kidizoom DUO by VTech. 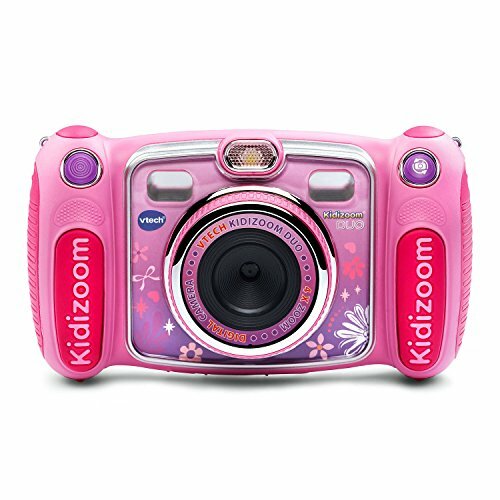 This real digital camera is great for kids and is durable enough to handle drops and tumbles. The Kidizoom DUO features a 2.4" color LCD screen and can take photos and videos in addition to a rear-facing camera that’s perfect for taking selfies. Your child can also get creative using laugh-out-loud photo effects in addition to cartoon and collage effects. They can download their photos and videos to a computer using the included micro USB cable (for file transferring and not for charging) and share them with family and friends. For even more fun, they can also play five included games, including three that are Motion-controlled. Camera is not rechargeable; it operates with 4 AA batteries included for demo purposes, use new batteries for regular use.